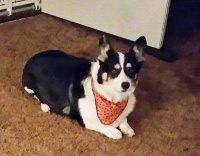 Piston is a 10 year old, Pembroke Welsh Corgi. About 5 years ago, Piston fell in an open register hole in our house – we were refinishing wood floors. After he fell in, he took off running again. I didn’t give it much thought until a few days later, when he wouldn’t put any weight on his left front leg. I took him to my regular vet for x-rays fearing he broke something. X-rays showed lots of swelling but no breaks or fractures. Pain meds were administered and out the door we went. Since then he has issues with that leg off and on – won’t put weight on it, limps terribly, etc. I sought out Dr. Christine after talking with someone who had used her. I scheduled Piston’s first appointment in December 2015. I noticed a difference immediately! We continued to see Dr. Christine for weekly visits for chiropractic, acupuncture and Magna Wave treatments every other week. Piston continued to improve with each visit. We now see her once a month and we continue to do the stretches that Dr. Christine has given us. Piston has begun to act like a puppy again! He runs, plays fetch, chases his fur sister and even tries to jump up on things again! He is no longer the “grumpy old dog” that he was. He is happy and healthy again Thanks to Dr. Christine!! I never thought I would ever take an animal to a chiropractor in my life. That was for crazy people who didn’t know what else to do with their time and money. I am a true believer now!! Dr. Christine has given me my buddy back and made him young again! !